I'm a little behind on planning the menu for our holiday shindig tomorrow night. I always have so many dessert recipes I want to make that I have to pare back for fear of putting everyone into a sugar coma. But one thing I will definitely be making is my favorite no-bake Icebox Zebra Cake. My mom (and probably everyone's mom) used to make it in it's classic form- cookies stacked with whipped cream in a log shape. But I like to make it in a cake shape, like this photo from Smitten Kitchen. It's fast, delicious, and has to be made ahead of time (I'll make mine this afternoon), so I can just pull it out of the fridge right before the party. 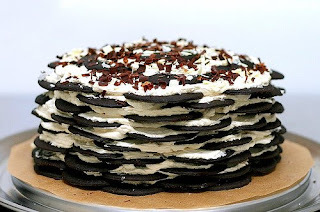 The hardest part of making this cake is finding the elusive Nabisco Famous Chocolate Wafer cookies it requires. I used to have to order mine in bulk from Amazon, but happily they sell them at the Gristede's grocery store by my new apartment (which was obviously a major selling point for this place for me). If you can't find them, you can sub in chocolate graham crackers, and break them to form the circle shape. the layers won't turn out as pretty, though, so you might want to "frost" the whole thing with more whipped cream before serving. A little more whipped cream never hurt anybody. In a large bowl, beat cream, powdered sugar and vanilla with an electric mixer on high speed until soft peaks form (if you don't have a mixer, you can use the canned whipped cream instead- you will probably need 2-3 cans of cream). On a flat plate or cake stand, arrange 7 cookies in a flower shape, with 1 cookie in the center, and 6 around it. Spread with 1/2 cup whipped cream, making a 7-inch circle (staying 1/2 inch away from the edge of the circle of cookies). Repeat with remaining cookies and cream, making 11 layers of cookies. If some of the cookies are broken, put them on the inside, and keep the pretty round edges on the outside. Top with a layer of cream (there will be a few cookies left over). Cover with plastic wrap and refrigerate overnight (or for at least 8 hours). Just before serving, sprinkle with chocolate shavings. Hmm, so that's how it's done. Thanks Lily! Hey Lil, what if you whip a little Grand Marnier into the cream?